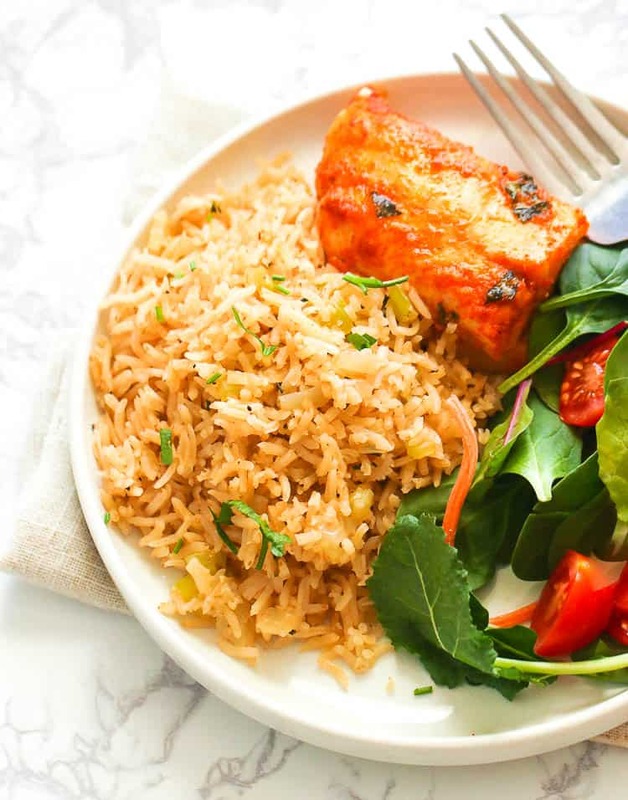 Rice Pilaf – an upgrade to your everyday rice made with white rice simmered in a chicken broth and seasoned with Creole Seasoning. Fluffy, fragrant, tasty rice with a kiss of warm flavors! Looking for another way to upgrade your everyday rice? Well, I have the perfect rice recipe for you to serve on either regular days or holidays. Today, we’re taking Rice Pilaf dish to a new level featuring my go-to Creole Seasoning that transforms even the simplest dish. And you don’t need to slave in the kitchen to achieve this fragrant and delicious side dish! Rice Pilaf, also known as “pilau”, “pilav”, “pulao” or “pilaw”, is a rice dish that features rice cooked in a seasoned broth along with other spices and additional ingredients like meat or vegetables. It also refers to the cooking method itself of which rice is cooked in a seasoned broth. The said technique actually originated from the Middle East and has quickly gained popularity in the neighboring countries and soon all over the world including here in the U.S. I always believe that anything in moderation is good. Do you agree? Rice is among those that gets a bad rap when consumed excessively as it adds belly fat and spikes up the glucose. So to answer your question, this Rice Pilaf recipe here isn’t the healthiest option. But it’s quite healthier than the regular white rice as it is packed with celery, sliced of zucchini – among others. It’s better than that plain white rice, right? But you can always switch it up with brown rice or wild rice or load up on adding wholesome fresh veggies into it. Replacing butter with avocado oil or any healthier oil would slightly make it wholesome, too. What Is The Difference Between Pilaf and Risotto? Rice is perhaps the most, if not one of, versatile ingredient there is. If you hop around the blog, you can somehow check out a couple of rice dishes here and there. Growing up in Cameroon, rice has become one of our go-to side dishes and we prepare an incredibly flavorful rice dish like this Jollof Rice. When I moved here in the U.S years and years ago, I could hardly believe how rice isn’t that much consumed. LOL .  Believe me, it was hard for me to adjust at first! Then, I eventually introduced myself to this wide array of rice dishes to build a deeper connection with it . Risotto and Rice Pilaf are just two of them. Risotto. If you haven’t tried making risotto at home, you probably should. 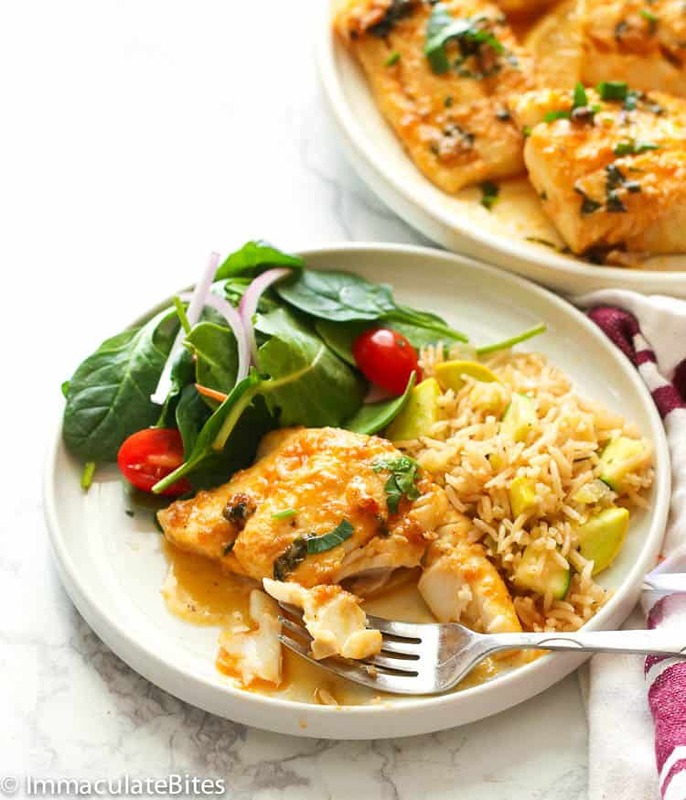 It’s a creamy, very comforting rice dish made with arborio rice slowly simmered in a flavorful chicken stock layered with smokey, cheesy flavors. Very comforting and perfect as a replacement for your morning porridge. Rice Pilaf. Unlike Risotto, Rice Pilaf is on the drier side of the spectrum. It is a rice dish that can be made with a wide variety of rice and simmered in a flavorful broth that features other ingredients like vegetables and fruits. With its versatility, Rice Pilaf could either be sweet or savory and can be easily customize for any table. What Can I Add To Rice Pilaf? Rice Pilaf is a super versatile kind of dish. 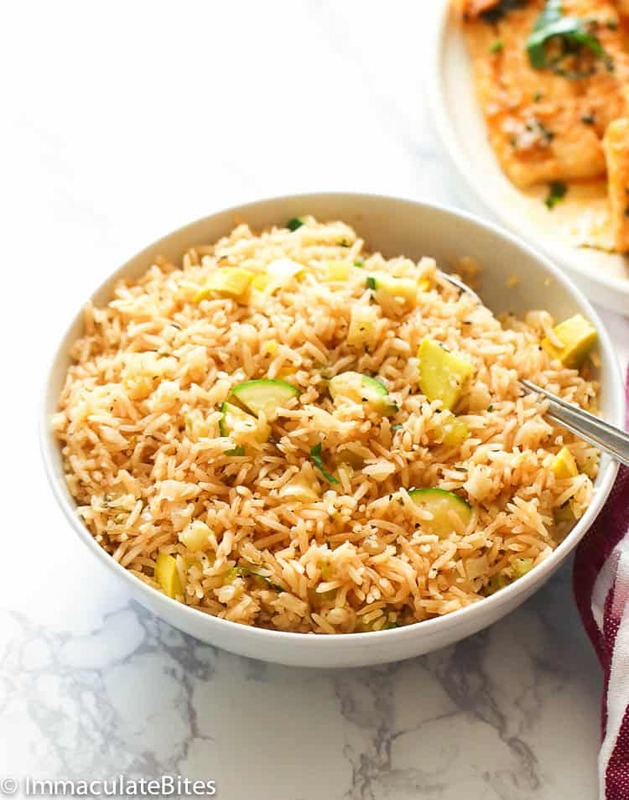 If you google online “rice pilaf“, you will see a bunch of versions of this dish ranging from healthy vegetables add-ons like chopped zucchini, carrots, peas, and sauteed mushrooms – among others. Moreover, you could also add raisins, currants, nuts, dried apricots, apples, cranberries, etc. Your imagination is limitless! And that’s why I love love this rice dish dearly ’cause it gives you that freedom to go with what suits to your liking. Can You Make Rice Pilaf Ahead Of Time? Oh yes, of course. This is one of those holiday sides dishes that you can make in advance. Just follow the cooking instructions and let it cool down before covering and storing it in the fridge a day in advance. Just reheat the pan over low heat and add a little more butter if it seems to be dry. How To Serve Rice Pilaf? 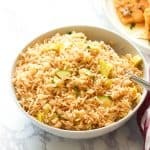 I typically serve this Rice Pilaf on random days since it pairs well with almost anything on my list. It goes perfectly with pan-fried/seared fish or Stuffed Pork Chops. And not only that, this is also a good side dish for fancier dishes like a Turkey . 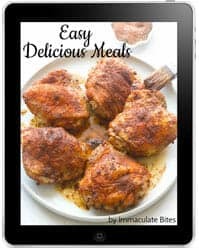 You’ll definitely have a more filling and interesting meal right in front of you! 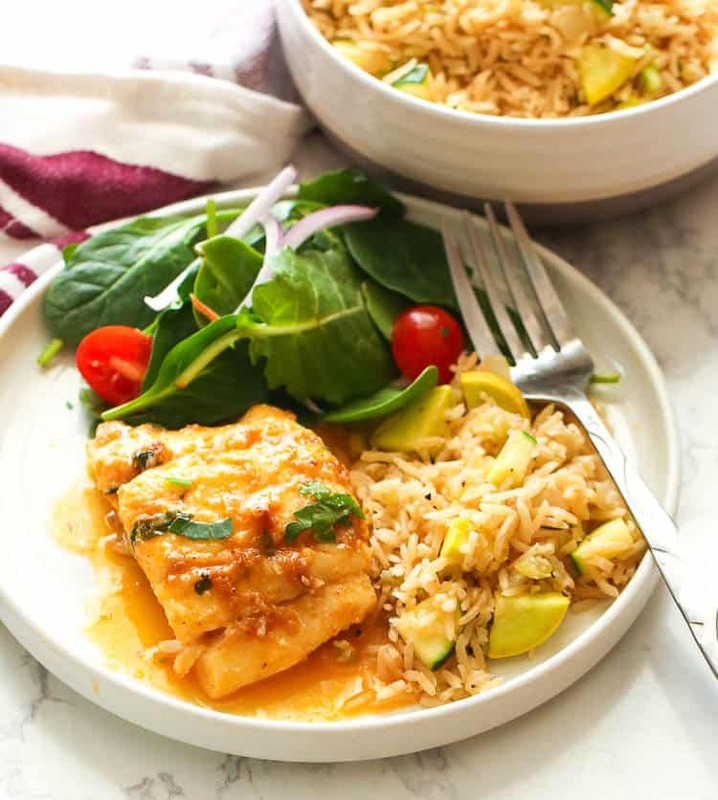 For those who observe the Holy Week like I do, you can pair this Rice Pilaf here with this tasty and super easy Baked Cod Recipe as pictured above. I use white long grain rice for this rice pilaf recipe – the longer the grain, the fluffier the rice is. You may replace butter with any cooking oil. But if you prefer a layer of flavor of it, then use butter. For extra flavorful Pilaf, I use chicken broth, but actually you can use water instead. Just adjust the seasonings to suit your taste buds. 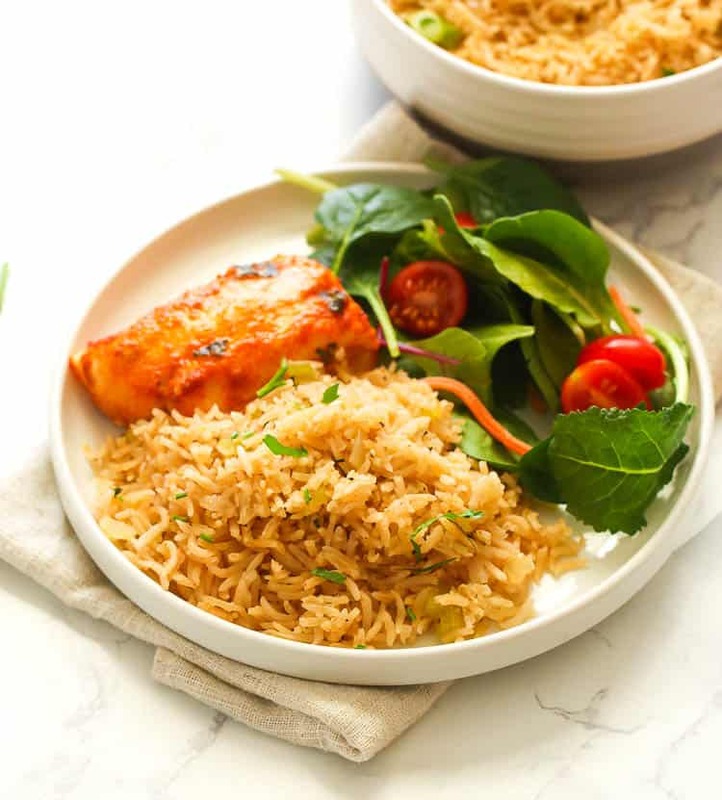 Rice Pilaf - an upgrade to your everyday rice made with white rice simmered in a chicken broth and seasoned with Creole Seasoning. Fluffy, fragrant, tasty rice with a kiss of warm flavors! Melt butter in a medium sauce pan over medium-high heat. When the butter has melted, add rice and brown stirring occasionally, for about 2-3 minutes. When rice is brown, add onion, celery, garlic, thyme and cook for a minute until onion become soft and translucent. Season with salt, pepper, Creole seasoning and add bay leaf. Cook stirring often until fragrant, for about 30 seconds. Pour chicken broth into sauce pan and bring to a boil stirring once or twice. Reduce heat to low, cover sauce pan and simmer until rice is tender and liquid is absorbed, for 15-18 minutes. Remove pan from heat, stir in the green onions and zucchini (if using) and let it sit covered for 5 minutes then fluff rice with a fork or serving spoon. I use white long grain rice for this rice pilaf recipe - the longer the grain, the fluffier the rice is. When rice is brown, add onion, celery, garlic, thyme and cook for a minute until onion become soft and translucent. Season with salt, pepper, Creole seasoning and add bay leaf. Cook stirring often until fragrant, for about 30 seconds. Pour chicken broth into sauce pan. And bring to a boil stirring once or twice. Reduce heat to low, cover sauce pan and simmer until rice is tender and liquid is absorbed, for 15-18 minutes. Remove pan from heat, stir in the green onions and zucchini (if using) and let it sit covered for 5 minutes then fluff rice with a fork or serving spoon. Garnish with parsley and serve. can i use jasmine rice?? I use wild and brown rice with whole wheat vermicelli to make pilaf. The flavor is greatly increased as well as texture. Thanks for sharing your thoughts, Allen. “Healthy” and “healthful” are 2 different words with different meanings.